Terrell Donnell Sledge as J. Allen, Will Cobbs as Oscar, David Pegram as Chet Simpkins and Eddie R. Brown III as W.W. The Tuskegee Airmen are more than a story in a history book. They were real men, with real dreams and real struggles, and ultimately, they were real heroes. “History is the river we stand in, knee deep” says Army Air Corps veteran Chet Simpkins (David Pegram) upon looking back at his time serving with the famed group of African American aviators in World War II, noting that people don’t usually realize they’re making history until it’s in the books. Simpkins has been invited, along with other surviving Tuskegee vets, to attend the inauguration of President Barack Obama in 2008, and he narrates the story of his training as a young recruit, and his experiences with the grueling training regime and brutality of war in addition to the also brutal racism of the era. This is Fly at the Rep, a truly astounding production that celebrates the bravery of these men and their perseverance through adversity and tragedy, as well as bringing to the audience a unique experience of flight. The story, based on the experiences of real Tuskegee vets, follows four young men with different backgrounds and motives, but the same ultimate goal—to be Army Air Corps pilots. Chet, from New York City, who is already a licensed pilot even though he’s the youngest of the group, enlists for the love of flying. W.W. (Eddie R. Brown, III), from Chicago, signs up to impress a girl. J. Allen (Terrell Donnell Sledge), from the West Indies, wants to please his father, and Oscar (Will Cobbs), from Iowa, joins up because he was told a black man can’t succeed as a pilot and he wants to prove the narrow-minded naysayers wrong. We get to see the grueling training program—which is all the more harrowing for the Tuskegee recruits because of the institutionalized racism of the time, where black men are not expected to be able to do the same jobs as white men and aren’t even allowed to drink in the bars unless they go to the back room. They are insulted, underestimated, and pressured to wash out by their white instructors (Timothy Sekk and Cary Donaldson) and commanding officer (Greg Brostrom), but they stand their ground and fly their planes. There are also interpersonal conflicts among the recruits themselves and, finally, there is the war overseas, where the Tuskegee men fly fighters escorting bombers on missions. 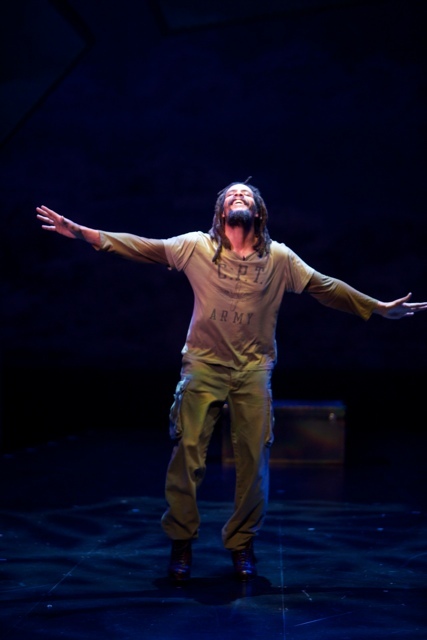 Throughout all this action there is the Tap Griot (Omar Edwards), a dancer who portrays the emotions of the characters as the story unfolds. One of the great things about live theatre is that so often, it is able to surprise me. This show is like nothing I’ve seen before. The staging is dynamic and takes the audience into the middle of the action, and up to the skies with the brave young pilots. The flying scenes are truly thrilling even though they are staged with surprising simplicity. Simple metal chairs become the training planes and fighters, with the aid of sound effects, projected images on several screens, and sometimes a fog machine. The suspense of the training flights and, ultimately, the combat missions is made unbelievably realistic with just that simple staging and the excellent performances of the actors. The performances are nothing short of wonderful. Pegram is the heart of the show as Chet, the eager young recruit with an infectious love of flight. He also often serves as a peacemaker in the midst of his friends’ conflicts. Cobbs as the determined, idealistic Oscar is also excellent, as is Brown as the slick and smooth-talking W.W. Sledge as the earnest J. Allen is convincing as well, and all four of these actors make their scenes completely believable, from the initial distrust to the inter-personal conflicts and sure but gradual bonding. Sekk and Donaldson are also great in the war scenes as two Caucasian bomber pilots who are escorted by the Tuskegee men on a series of suspenseful missions. I found the war missions to be the most intense and engaging part of the play, particularly a scene involving the song “Don’t Sit Under the Apple Tree” that’s alternately funny and extremely moving. There’s also a great scene late in the show that uses the song “Straighten Up and Fly Right”. The excellent performances full of truth and conviction combined with a convincing World War II atmosphere work together to make a truly spellbinding presentation. In the midst of all of this action and compelling story is the omnipresent Tap Griot, electrifyingly danced and acted by Omar Edwards. He opens the show, tapping before a projected tableau of the history of injustice toward African Americans and the hope and determination of the Civil Rights Movement, and reappears throughout the story, portraying the four main characters’ emotions in the midst of their various conflicts and triumphs. When a character experiences disappointment, or anger, or hope, or relief, Edwards is there with his dynamic, expressive tapping, helping the audience to not only see what the pilots are experiencing, but to feel it. The set is minimal, with the chairs that double as planes, footlockers for the recruits, and occasional furniture as needed. 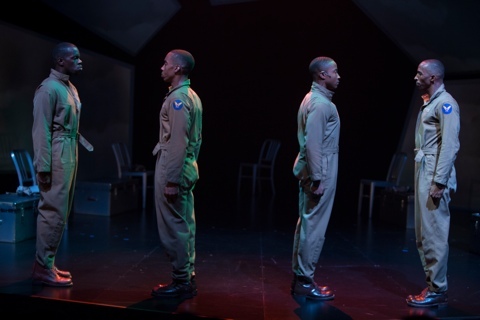 This is all backed by a series of screens framing the stage, featuring projections to fit the various situations in the play and, at the end, to show a photo montage of real Tuskegee airmen, in action during the war and many years later, as veterans at President Obama’s inauguration. The sound effects, lighting and fog effects contribute to the overall atmosphere and are superbly arranged by designers Rui Rita and Jake DeGroot (lighting) and John Gormada (sound). This play serves an an excellent education for today’s audiences about an important chapter in American history that needs to be remembered. These young men were all the more courageous for having endured such vile treatment and the evils of segregation, and then risking their lives to defend their countrymen in the war. Even though this is a “war story” and as such, there are a few elements that are somewhat predictable, what is presented is done so with real drama, energy, intelligence and wit, and in a thoroughly convincing way. It’s a story that must continue to be told, lest we forget its valuable lessons. This production is live theatre at its best. It’s a well told story, fully realized by an outstanding cast and crew, conveying a message of determination and hope in the midst of great injustice. It’s the story of a group of determined young men who endured great trials and became heroes. It’s a history lesson brought to life in a way that I will remember for years to come, and another example of top-notch theatre from the Rep.